Bair Financial Planning is a San Diego Wealth Management Firm. Since 1992 we have been specializing in helping female CEO’s, LGBT Families and successful business owners make important financial decisions that impact their future. We are a team of experienced Wealth Advisors that love what we do. We pride ourselves in creating a safe and comfortable environment where our clients can be open and honest about who they are to share what concerns them and what is important to them and their family. We were founded with the goal of providing quality unbiased advice which allows us to work with our clients without any conflicts of interest, which is why we have an alliance with LPL Financial and The Wealth Consulting Group to provide additional resources for our team and our clients. What excites us is seeing our clients pursue their personal & financial goals to make a meaningful impact with their life and within our community. Our custom investment portfolios are designed with the goal to help you align your values with your investments by supporting companies that have a positive history of human rights, are environmentally sustainable and socially aware. We feel we have a responsibility to support our community and companies that are making a positive impact in our world. We have refined a time-tested 5 Step Process that helps you gain clarity and confidence around your financial life to help you manage your personal & financial goals to work towards a secure and comfortable retirement. This allows our clients to live their life by design and not default. 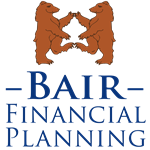 For more information on our Services and our Bair Financial Planning 5 Step Process and how we work with our clients Click Here. We welcome you to give us a call at 619-546-6160 or come in and sit down and talk to us about your personal situation.